Zoutei wa Hajimari to Owari. According to the customer, this is a Taoist phrase used in their karate dojo training. Thankfully the customer guided me to some correct words. The translation took much guidance from the customer because I was using particles that were not necessary at times and I used the word Present as in tense or now, but the word was actually to mean gift or a thing presented to someone else. What I liked about this scroll or Kakejiku is Yoshimi’s ability to balance everything in the writing, which included the writing of Enso in the top left corner (facing away from the scroll), the Large Enso Circle, with the signature to the right and then the writing in a Gyousho, semi-cursive style. This was more writing than we have usually put on a scroll, and the phrase underneath was written with a Hosofude, or thin brush. It is our ideal to provide what the customer wants within reason. The Katana and Wakizashi are more appropriate for this display as the Dojo from the Great Lakes Region of the US, trains in the sword arts. He gave me a beautiful essay and write up on some of the philosophies they used, but being a laic in regards to martial arts, I honestly only understood about 65% of the essay. But what new things I did learn were very enlightening, particularly the new sword vocabulary in Japanese. The customer chose a wine color cloth, and it is complemented the Enso circle along with a beautiful high gloss black lacquer wood jikusaki that has a gold band around the outer edge. The scroll includes a Gold Kakehimo with a white arrow pattern in it giving it a distinct look. The deep gold Ichimonji seems to help provide a good contrast between the work and the Kireji. The scroll is in the Maru Hyougu style with the following Dimensions in the traditional Japanese measurement of 分 Bun. This customer sent an order directly online via my shopping site at http://ww.shop.customjapanesecalligraphy.com/ I think these turned out beautifully for him. The first scroll on the left (if facing away from the scrolls) reads Ryukyu Hon Kenpo, which means the True Kenpo of the Ryukyu islands. 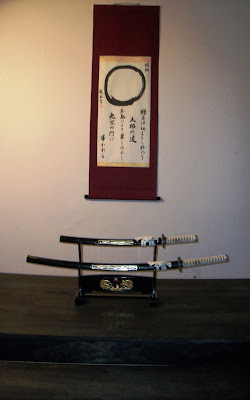 The scroll on the right reads Okinawa Shirodzuru Kenpo. This could be translated as Okinawan White Crane Kenpo. The scrolls are written in the Sousho or full cursive style which provides a very beautiful flowing ideal to the work. I must respect Yoshimi for being able to take one phrase that contains 5 characters and one phrase that contains 6 characters and write them very symmetrically on the same size of paper. I used a red-orange Ichimonji to provide the imagery of a sunset on the backdrop of a green Okinawan island set in the Pacific. 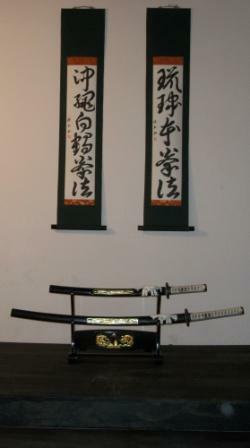 The katana and wakizashi may not be the most authentic accent to put in a display with scrolls conveying an Okinawan theme. A better weapon choice may have been an Eiku, Tonfa or Nunchaku, but we must make do with what we have. I thank Sylvan and Hiromi Pickett for allowing me to borrow these for this display picture. This is the basic Maru Hyougu style and dimensions in the traditional Bun分 measurement set forth with other dimensions as approximations. This scroll is for sale. Although there were quite a few problems, and still some slight "Uki" in the scroll, it turned out all right. It was written by my wife, Ryugyoku, and the inkan or chop will be applied soon. The meaning of the phrase ikishouten is listed in one online dictionary as High Spirits. I think it is better to look at it as having such conviction that it feels like being lifted into Heaven. The first thing to be aware, is this is not a true Fukuro Hyougu style scroll. A true Fukuro Hyougu scroll does not have an Ichimoji section on the scroll. I wanted to do something a little different. I think the black suji provides a subtle transition between the cloths. I hope you feel the same. Here are the Dimensions leading with the traditional　分 Bun measurement. 筋 suji were all done in 1 bun measurements.